When there are not enough cards remaining in the Online deck to restore your hand to 10 cards, draw down to zero, then send ALL the cards on your side of the board, except the Rookie, Offline. Shuffle them and place them face down Online. You may then draw as many as needed to restore your hand to 10 cards. Note: If at any time during play the number of your Online cards goes down to zero (either by your action or your opponent's), you must send ALL the cards on your side of the board, except the Rookie, Offline. Then shuffle them and place them face down Online before resuming play. Winner of the last Duel initiates the new Duel by starting at step #2 of DIGIVOLVE. If the last Duel ended in a tie, the player who went first last time initiates the new Duel. In EXAMPLE D, your opponent has decided to change his or her Rookie, and has set up the change by placing the new Rookie face down on top of the old Rookie on the Duel Zone. He or she also sets up to Digivolve the new Rookie by placing a Champion with the correct Digivolve Requirements face down on the Digivolve Zone. After drawing from the Online deck to restore your hand to 10 cards, you see an opportunity to Digivolve your Champion to Ultimate. 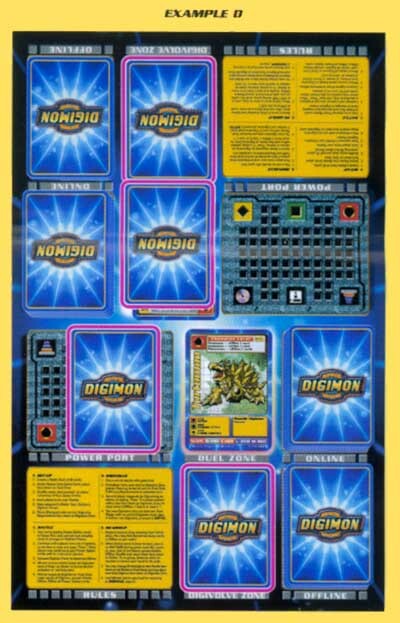 In this case, the Digivolve Requirements of the Ultimate you want to play call for the use of a DIGIVICE Power Option card. You place the Ultimate card face down on the Digivolve Zone, and place the appropriate Digivice card face down on the Power Port. Since you won the last Duel, you begin the new one by turning your Ultimate card face up and placing it on the Duel Zone. The Battle is on! Tip: Take time to become familiar with your Digimon. They each have a unique personality. Many of them have Special Abilities, and some of them have powerful Special Effects that you can use to your advantage in DIGIMON DIGI-BATTLE!